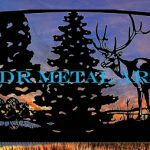 Custom Driveway Gates by JDR Metal Art - Home, Farm, Ranch & Estate - Custom Driveway Gates - Iron Steel & Aluminum - JDR Metal Art - FREE Standard Shipping! 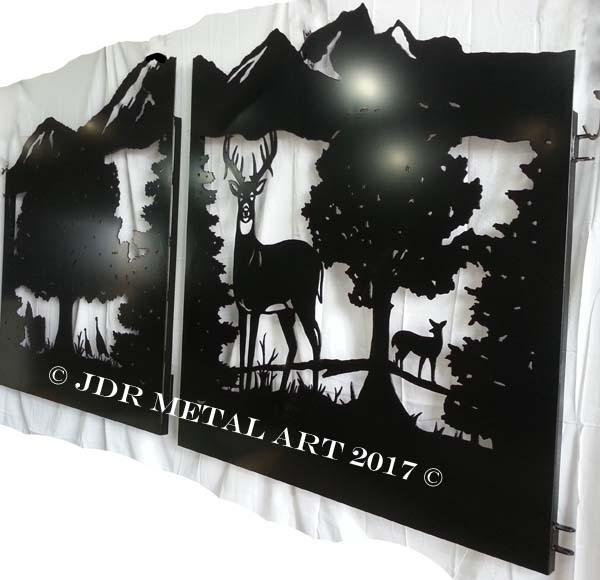 JDR Metal Art makes it easy for you get the finest custom driveway gates, no matter where you’re located. Handcrafted from steel, iron or aluminum, our driveway gates are personalized for your property entrance at a great price. Our design themes include but are not limited to wildlife & nature gates, horse & equine gates, ornamental tree gates,as well as traditional & wrought iron themed gates. We compete with gate companies nationwide & offer FREE shipping to your local FedEx & UPS freight terminals. We also offer heavily discounted commercial & residential delivery rates! Need a custom gate design? 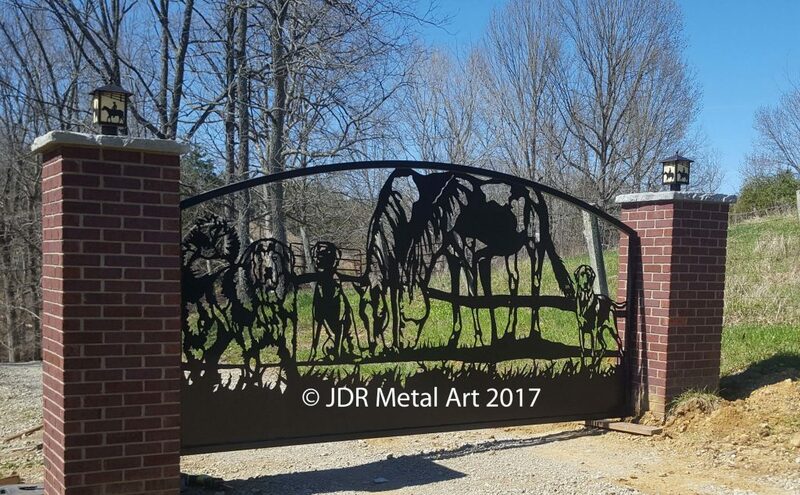 JDR Metal Art Creates the Widest Variety of Gate Designs! If you like a driveway gate with one of our many existing designs “as-is” then of course there is no design deposit required. If you want something similar to what is shown on our website but with modifications there may be a small design deposit required to initiate the process. 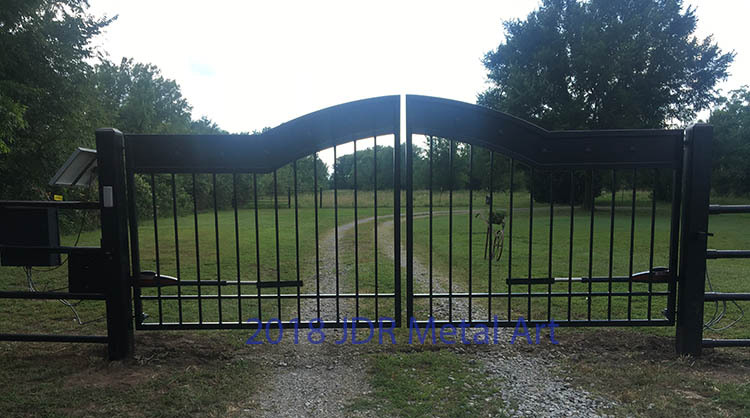 If you need something brand new created from scratch we’ll get started on it today with a $299 deposit to create your brand new metal gate design. **All design deposits apply to final gate balance!! 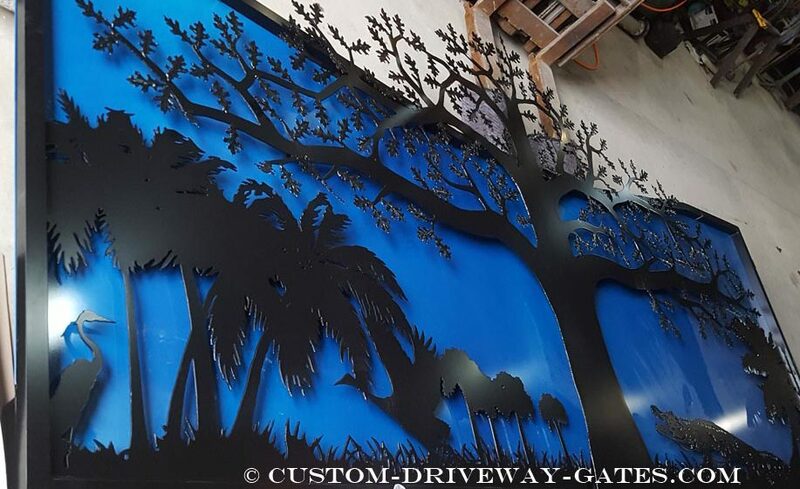 Plasma cut driveway gates are our specialty craft. 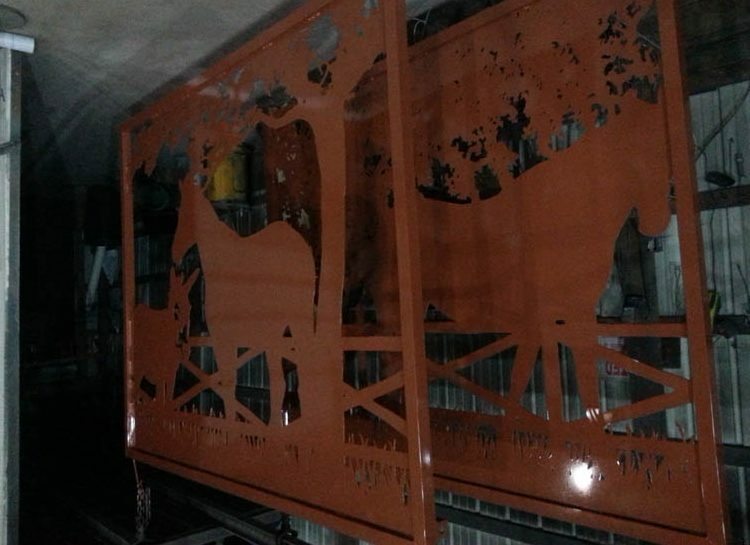 We’ve been plasma cutting since 2001, beginning in industrial fabrication and shifting to metal art in 2004. Plasma cutting is a highly efficient way to create strong and durable decorative driveway gates in practically limitless shapes & sizes! 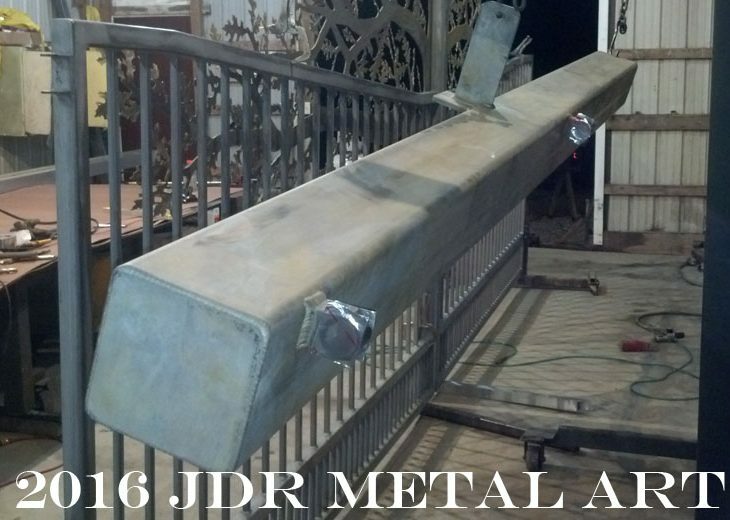 Although we specialize in plasma cut driveway gates there is still no such thing as “cutting corners” at JDR Metal Art! Everything is top notch when complete. 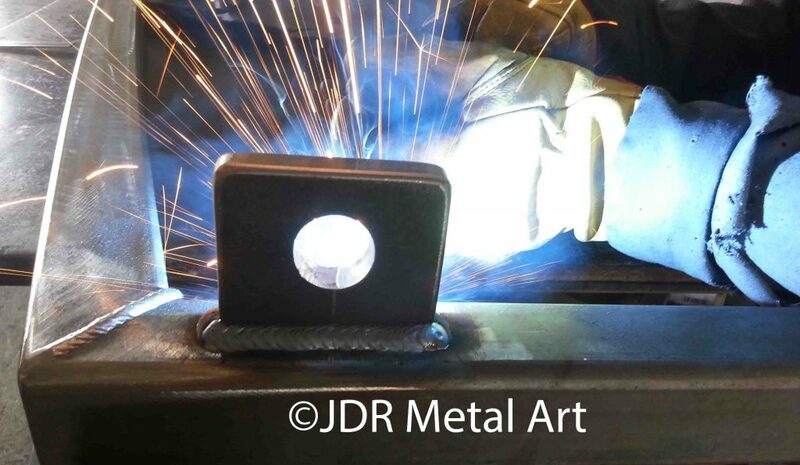 Welding 1/2″ thick steel driveway gate hinge bracket to back side of metal gate. Our award-winning welding & fabrication work remains second to none. For our metal driveway gates we always use a minimum of 1/8″ (.125 inch thick) material thickness for all gate construction. That’s whether we’re working with steel, aluminum, or iron. 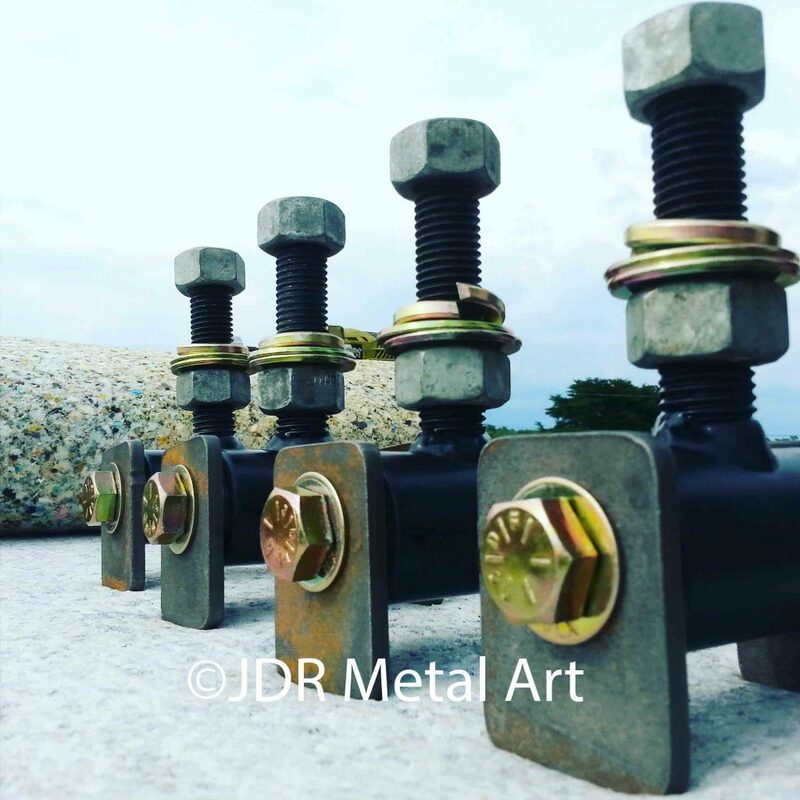 Load bearing components are always at least 3/16″ in wall thickness. Compare that to our competitors who typically use the bare minimum industry standard 14 gage (.083 inch thick) that is only about 60% as thick as the materials we build gates with. Our standard mounting posts are made from 4×4″ square tubing with a minimum of 1/4″ wall thickness. We also build 6×6, 8×8 and larger gate posts. Shown below is a 6×6 post with the hinge and gate opener brackets welded in place prior to powder coating. We prefabricate the posts and hinge block mechanisms for each gate we build. 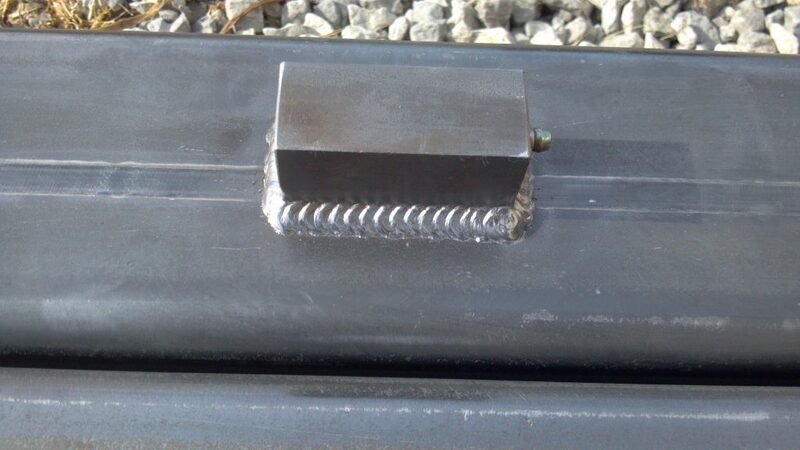 That allows for a simplified installation with no on-site welding required. The hinges bolt together and are adjustable so that the gates can be kept level. We use maintenance-free sealed bearing driveway gate hinges with a 2000lb load rating (per gate leaf). No greasing is required to keep the gates swinging freely. Our standard mounting posts are made from 4×4″ square tubing with a minimum of 1/4″ wall thickness. We most commonly create steel driveway gates because they are so strong and durable. Much like its precursor iron, steel is more susceptible to corrosion than aluminum when exposed to moisture and oxygen. When the situation calls for it, we also build aluminum driveway gates. Aluminum gates are a good choice for those who need a lighter gate or heightened corrosion resistance. Aluminum is less than half the weight of steel and has a very high strength to weight ratio. Although aluminum doesn’t actually “rust” it will still corrode in the form of “white rust” when not properly coated. Which material is best for you? Steel vs Aluminum. Powder Coated Driveway Gates – Done Right! Once upon a time we painted our gates. Then we learned through experience that powder coating provides a far better solution than wet paints could ever hope for. Since 2014 we have done our powder coating in-house. While we do the powder coating ourselves many gate companies either elect to outsource their powder coating elsewhere or resort to wet painting. Doing it in-house is great because it really increases the finish quality and brings much faster turnaround times than with outsourcing the powder coating. This results in a more competitively priced gate. Before being powder coated the metal must be free of any rust, oil or dirt and that is accomplished by sandblasting the driveway gates. With our powder coating line we have the capacity to powder coat anything up to 26′ long and approximately 9′ tall. It is extremely rare that there is a driveway gate too large for us to apply a powder coated finish to. The most critical aspect of metal finishing is, of course, proper part preparation and pretreatment. As mentioned above use sandblasting to remove all rust, mill scale, and dirt from the metal gate surface. 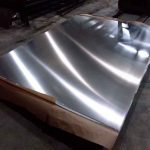 We also add eco-friendly cleaning and pretreatment solutions to prepare a very clean, oil and oxide-free metal surface. This sets the foundation for an extended coating life. It also eliminates toxic impact upon our environment. Each steel gate receives a coat of zinc rich primer for added corrosion resistance. This primer gives our steel gates an outstanding amount of resistance to the formation of rust, even when the powder coat has been scratched all of the way down to the metal. This is followed by top coats of exterior grade polyester powder coating that is baked to a beautiful finish. Some metallic finishes even get a clear coat or we can add a clear coat on special request! Our standard topcoat color is a 60% gloss black specially formulated for high color retention and resistance to the elements. Aluminum gates are still sandblasted but they receive two coats of topcoat instead of any primer. The first layer of our polyester top coat acts as a primer layer on the aluminum. The second layer is essentially just an added layer of protection that we like to put on for an even longer finish life. Powder coat is more durable than paint, yet any dings or scratches incurred during installation are easily touched up with the corresponding Rustoleum paint color to keep everything looking great and rust-free. Aluminum Gates Fresh Out of the Oven! We guarantee that our gates will arrive in original condition. We contract with only the top rated freight carriers to have our custom gate creations delivered to our clients who are located nationwide. As frequent shippers we secure high level service at the lowest prices available for our valued clients. Gates are always securely wrapped and crated with foam packaging inside and also fully insured in the unlikely event that damage would ever occur during transit. 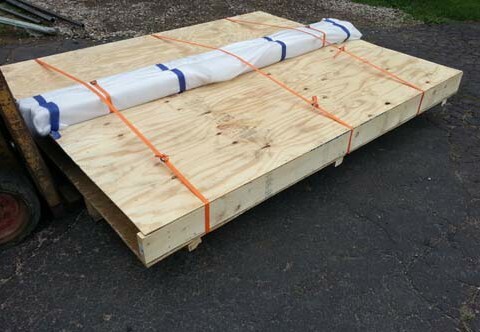 Our clients often opt to pick up their new custom gates from their local UPS or FEDEX freight terminal themselves, or send their contractor to do it for them. If residential delivery is the chosen method then gates and posts can also be offloaded from the freight truck either by forklift/skid steer or the skid can be quickly broken down upon arrival and the gates and posts offloaded by hand, one by one, with the help of several friends. Most gate panels weigh 250 lbs or less (more for much larger gates). Trucks with lift gates are available for our smaller gates at an extra fee. Our decorative driveway gates and ornamental driveway gates add value and security to your property, whether it is a home, farm, ranch or estate. Our custom farm gates make your farm entrance stand out from the crowd. We build these farm gates for a wide range of farms such as cattle farms, horse farms, elk farms, deer farms, sheep farms and practically any other type of farm you might own or manage! Ranch gates are a great way to keep livestock inside your property while keeping unwanted vehicles out. Our custom ranch gates are designed to integrate with your overall ranch theme. Your ranch is unique in it’s own way and ranch gates provide an opportunity to show it. Automatic entry gates are priced by the linear foot, plus the cost of automation equipment. An automatic entry gate will cost anywhere from $100/linear foot up to $1,000/linear foot depending on the design and quality of the automatic gate. Automatic openers typically add from $500 to $5,000 to the cost of the project, again depending on quality. Be sure to check out some of our recent gate projects over at our Driveway Gate Blog. There we regularly post content about the driveway gates we ship nationwide to our customers.